The intimacy of Schademann Studios, its wood paneled flooring and the penchant for the nostalgic, 40s era tune, creates a warm, comforting atmosphere for those desiring a timeless portrait, a far cry from the space’s former life, a horror and sci-fi memorabilia haven. Such a transformation is attributed to the hard sweat and talent of the man behind the camera, Matthew Schademann, who worked on rehabilitating the space for six weeks a day for five months. A photographer, animal enthusiast and cultural preservationist, he opened Schademann Studios, located at 6729 W. Roosevelt Road in Berwyn, in December 2013. 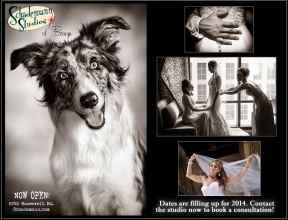 With photography services including dogs, portraits, vintage restoration and weddings both within the studio space and on-site locations, Schademann makes sure to be sensitive to the client’s needs as well as maintain his own artistic perspective. At 41, Schademann is a sleek and slender man with the edge of an urban professional. He has strong roots in Illinois. Growing up in Norridge, he was inspired by his grandmother’s love of craftsmanship. Primarily self-taught in photography, Schademann developed his professional skills that have propelled his business. He would translate these inherited skills to both photography and historic preservation, as he works for the Berwyn Historical Preservation Commission, and currently serves as a board director for the Berwyn Historical Society, where he digitally restores and archives photographs for the general public. One of his favorite subjects, his dog Brodie, is a stand out amongst his collection of photographs. Schademann perfectly captures the dog’s goofy energy in the frame, as someone who is passionate about animals and works with organizations such as the Animal Cure League of Oak Park. Schademann moved another version of his photography business from Roscoe Village to Berwyn because of the potential he saw in the neighborhood, and he carries the knowledge about what it takes to thrive in an often times difficult small business culture. Ultimately, it’s the independence that small business ownership affords that helps him enjoy his work as play. For more information on Schademann Studios, visit schademann.com.